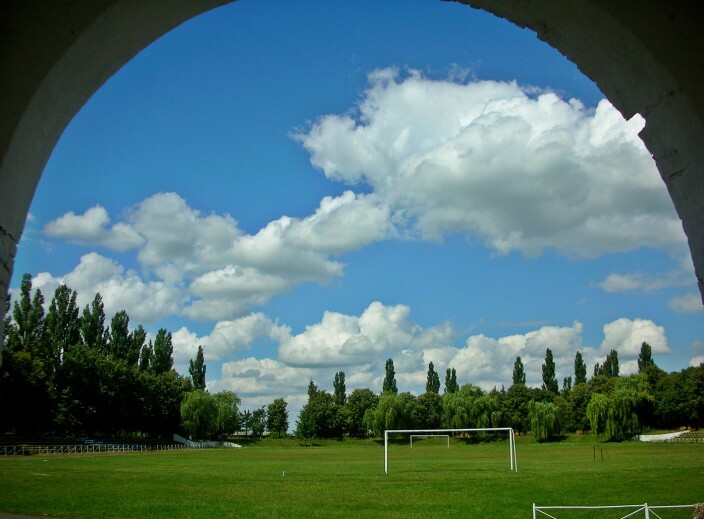 The small town of Letychiv in west-central Ukraine holds a special position for me. It’s the town where my wife was born and where her family still lives and thus, whenever we visit Ukraine, Letychiv becomes our de facto base of operations for much of our stay. 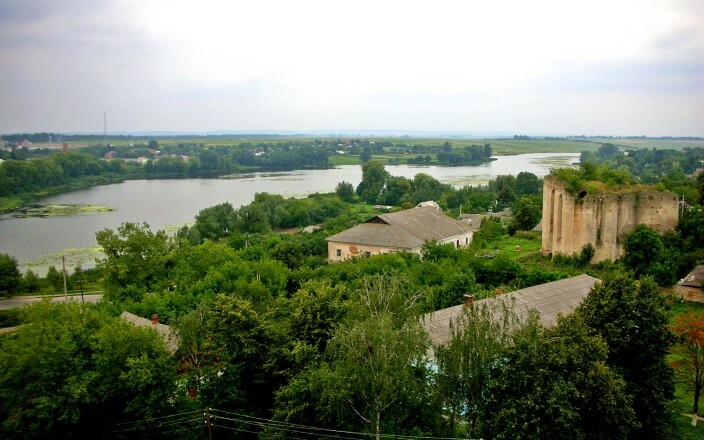 Situated on the main highway midway between the large cities of Vinnitsa and Khmelnitsky, and at the confluence of the Volk and Southern Buh rivers, Letychiv has a population of around 11,000 people. Modest and unassuming, Letychiv embodies many of the same sorts of charms as you would find in any similar sized city in the U.S., a quietude you would hardly expect given Letychiv’s tragic history. Like most areas of this part of Ukraine, its history is basically one long series of invasions and occupations throughout the centuries. Founded in 1362, the Tatars rolled through numerous times, then the Cossacks, Turks, and Poles all took their turns. And the depredations didn’t stop there. 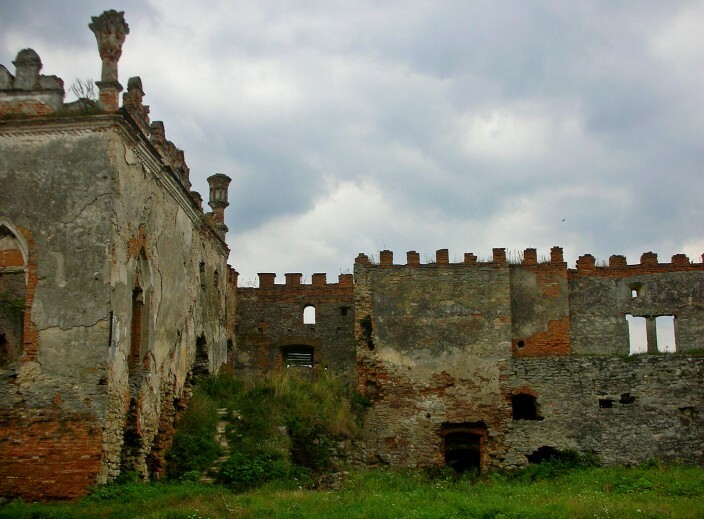 The area was especially ravaged in the twentieth century, first by World War I, then during the Ukrainian Civil War which followed the Bolshevik Revolution of 1917, leaving the entire town in ruins as this area of Ukraine was heavily contested by competing factions. The Soviets rebuilt the city nearly from the ground up after seizing final control in 1922. World War II brought the Nazis to town, where they held sway from July, 1941 to March of 1944. The area’s sizable Jewish population was used as road-building slave labor and then completely exterminated by the Nazis in three separate pogroms between 1942 and 1943. Walking around Letychiv today, you wouldn’t guess at any of this bloody history. 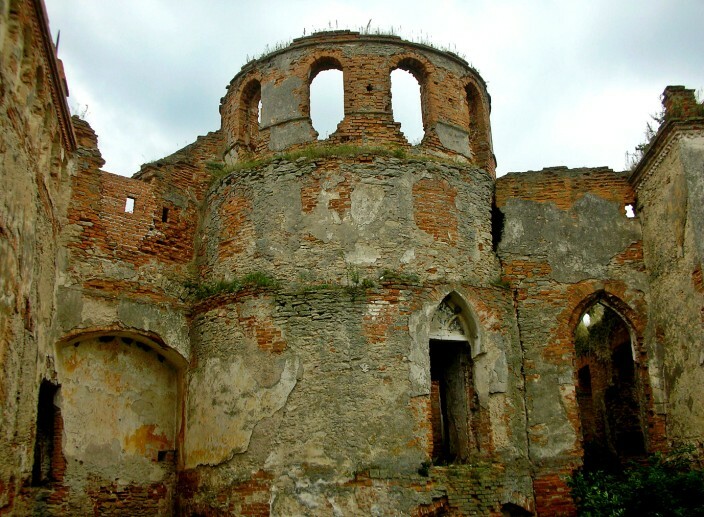 The only physical evidence of the historic past is one remaining tower of Letychiv Castle, with a large statue beside it of Ustym Karmaliuk, known as a sort of Ukrainian Robin Hood. 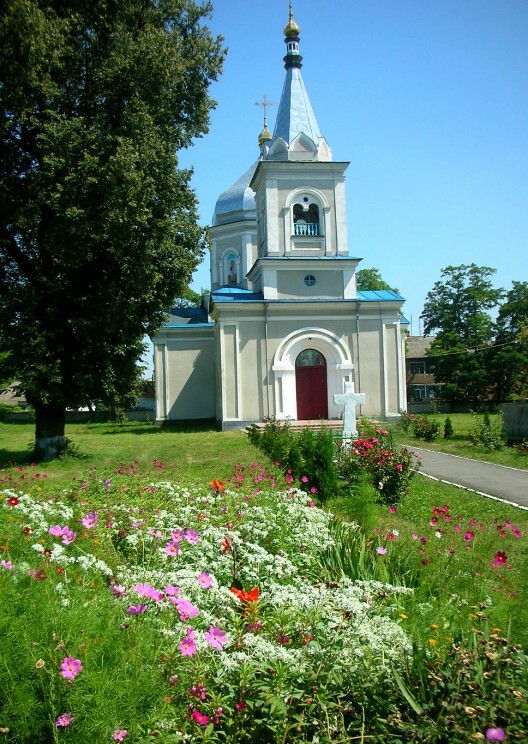 He operated in this region in the late 18th and early 19th century and is buried in Letychiv cemetery. 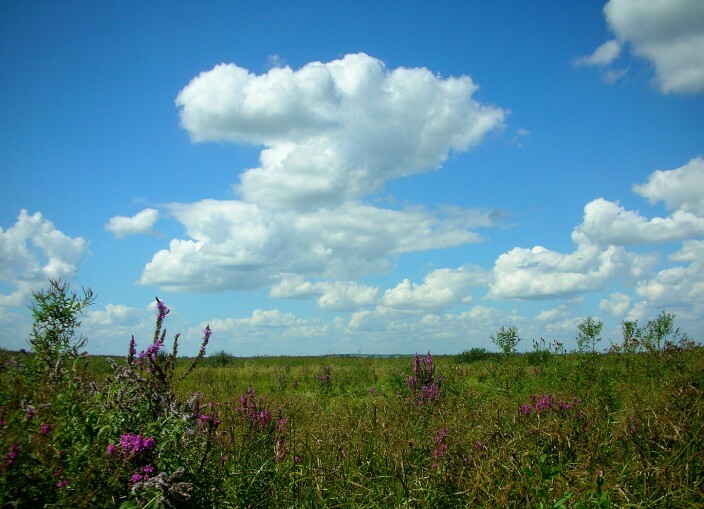 So what is life like for the average person in Letychiv? In many respects, I think it mirrors old-time small town life in America. People know their neighbors, they trade small talk over the fence, they spend time visiting in each others homes. Kids go to school, they play in the streets, teenagers hang out. Since it is a small town, most everything is within walking distance and as many people don’t own cars anyway, most folks walk or ride their bikes just about everywhere. Thursdays and Sundays are market days in town, no matter the weather or time of year. Portable booths and tents are set up for the day as the temporary market takes over several streets. Every conceivable type of locally grown produce is for sale, along with flowers, fresh meat and fish, dairy products, clothes, shoes, rugs, you name it, you can probably find whatever you’re looking for. 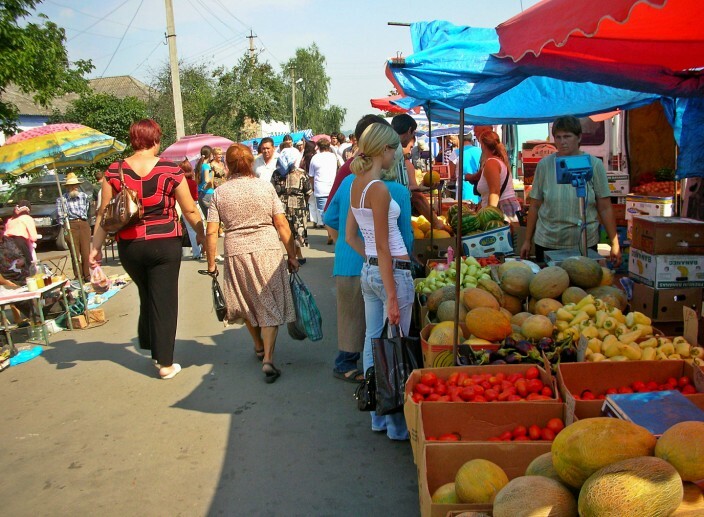 It’s a veritable open-air mall, and pretty much the entire population of Letychiv bustles through the market, shoulder to shoulder. Come early if you want the best selection, though no one seems in too great a hurry as this is a social event as well. People stop and visit, they haggle a bit over prices, and eventually everyone meanders homeward with bulging shopping bags. Many people have kitchen gardens (what we would call vegetable gardens) and these are not small plots in the backyard containing a few heads of lettuce planted for a hobby. This is a primary source of sustenance for a large number of people, where they grow their potatoes, onions, beans, corn and numerous other crops which will be harvested and stored throughout the winter. Without this food, many of them would have a hard time surviving on meager incomes, especially with food prices rising all the time and no commensurate gain in wages. I have nothing but admiration for these hardworking folks, most of whom hold full time day jobs, then come home and spend all evening working their fields, planting, weeding, watering and harvesting all by hand. On any late summer or autumn evening you can step outside and see men and women walking in from the fields around the outskirts of town carrying burlap sacks of produce home with them, or more often with several bags tied to the handlebars of their forty-year-old, one-speed bicycle. It’s a hard, labor intensive life that few Americans can imagine, just to have enough to eat. A lot of people raise chickens in their yards both for the eggs and for meat. Actually, a great number of the cluckers are out wandering the streets. If you’ve lived there all your life, I’m sure the pre-dawn crowing of your neighbors rooster doesn’t even register. For me, well let’s just say that more than once I was ready to provide our table with fresh rooster for dinner. 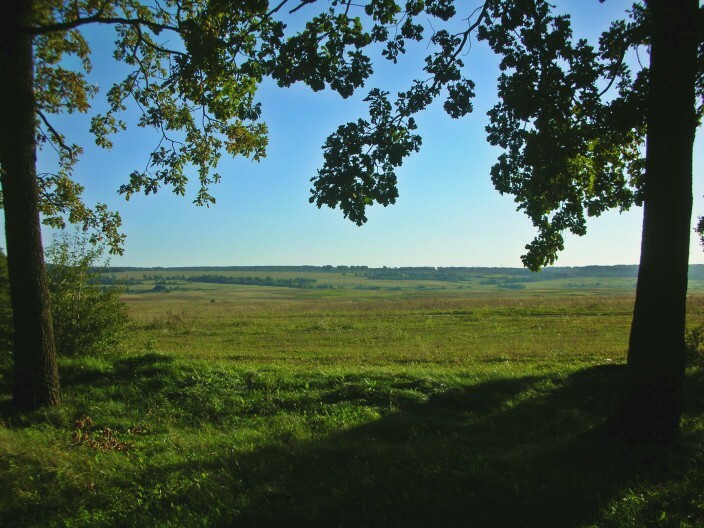 Beyond the fields which ring the perimeter of Letychiv you’ll find forests which also provide a bounty of food throughout the seasons. In late spring to early summer wild strawberries abound. Much smaller than domesticated strawberries, these wild berries are nevertheless very tasty if a bit tedious to find and back-breaking to pick, as they are low to the ground and not densely clustered. It can take hours to fill a jar or bucket. A month or so later come the wild raspberries, ditto for the hard labor to harvest them. 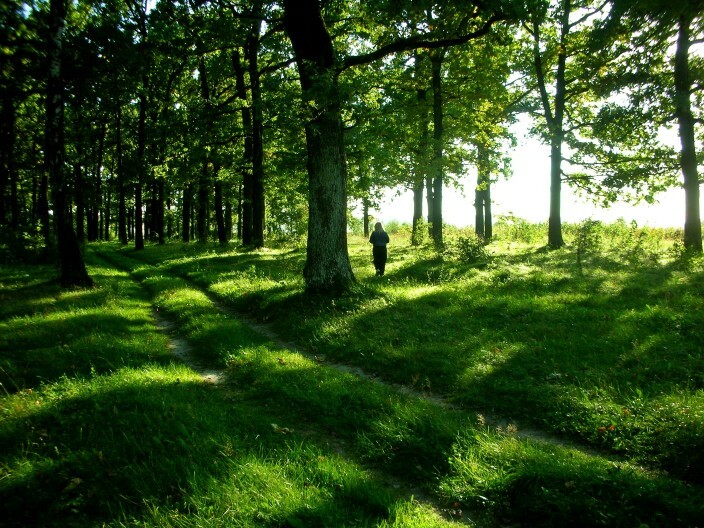 In late summer through autumn these same woods become a mushroom hunters paradise. Just make certain you go with a local expert, such as my mother-in-law, as the inedible varieties grow in the same profusion as, and right alongside, the edible ones. One thing you don’t want to eat is the wrong kind of mushroom. For a novice like me, it was fun poking through the grass and weeds trying to find as many mushrooms as everyone else. I failed miserably for a while, stumbling over and pointing out one after another. Mom would come over to look, smile and say, “That’s a very nice mushroom, but don’t eat it.” When I finally found something useful, picked it and threw it in the bucket, I couldn’t have been happier if it had been a gold nugget. It wasn’t until much later that my wife told me the one I’d found really wasn’t very good either, but they all felt bad that I was trying so hard and didn’t want to discourage me. 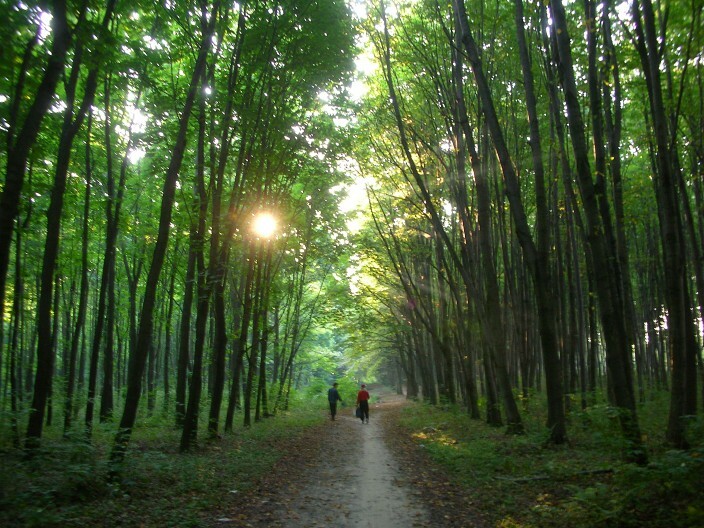 Besides berry and mushroom picking, the forest is also a popular place for locals to go and have a picnic during warm weather months. Food and drinks and blankets are packed up and the whole family will walk the mile or so to the woods. 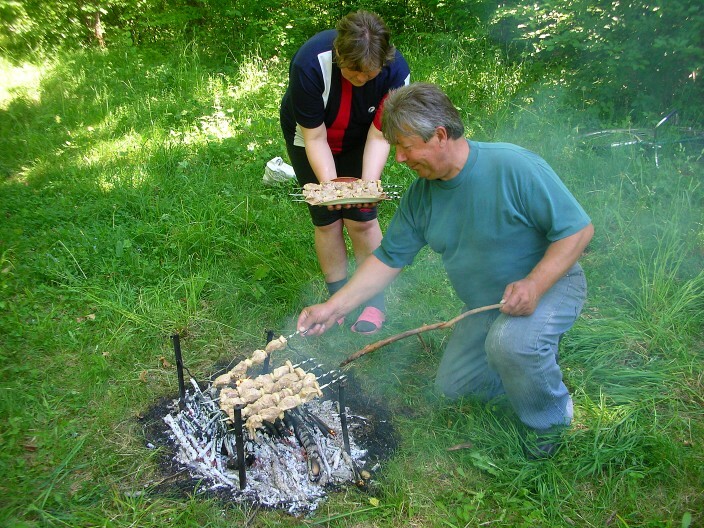 The men gather wood and build a fire while the women set out the food. 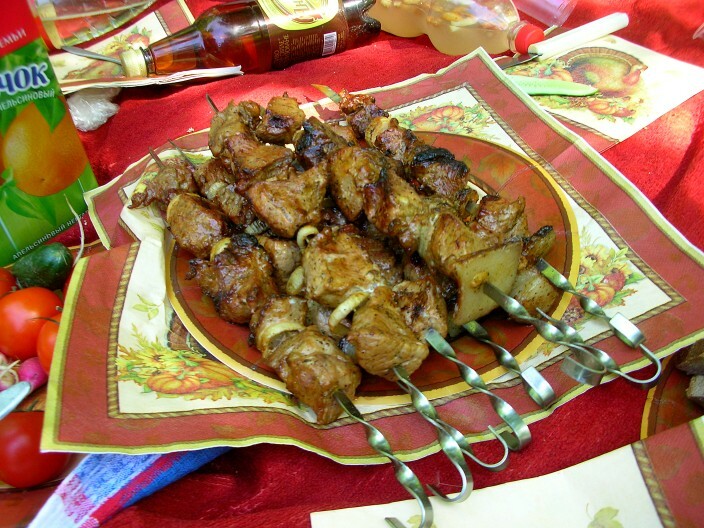 The most common dish is shashlik, skewers of marinated meat (usually pork) alternating with chunks of salo (pork fat), onion, tomato, sweet peppers, or whatever you want, roasted over the wood fire. It’s a relaxing way to spend an afternoon and there’s no hurry as everyone reclines on the blankets, drinks are poured, food is consumed and conversation flows. Hours later, when everyone is ready to burst, the gear is packed up and we all waddle homeward. 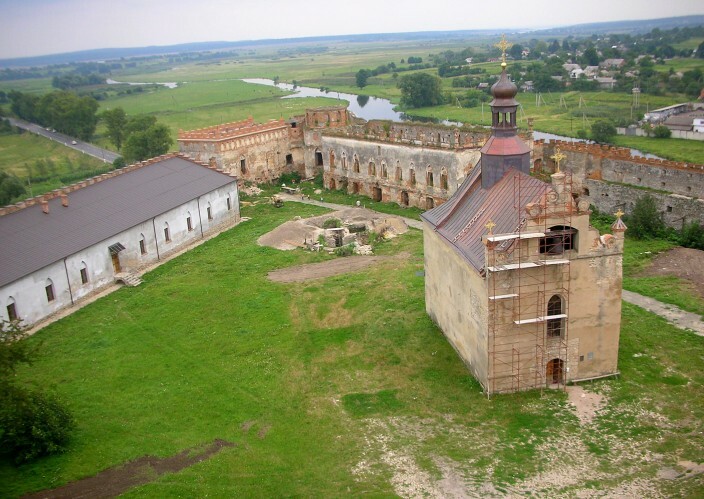 Although there isn’t a great deal of sightseeing to be found in the Letychiv area, one landmark worth investigating is Medzhybizh Castle, located in the village of Medzhybizh about 15 kilometers west of Letychiv at the confluence of the Southern Buh and Buzhenka rivers. 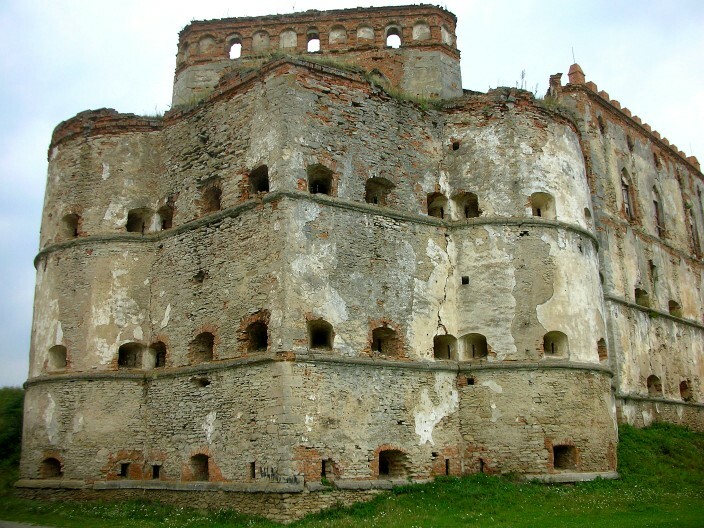 The castle was built in 1540 as a bulwark against Ottoman forces expanding through the region. 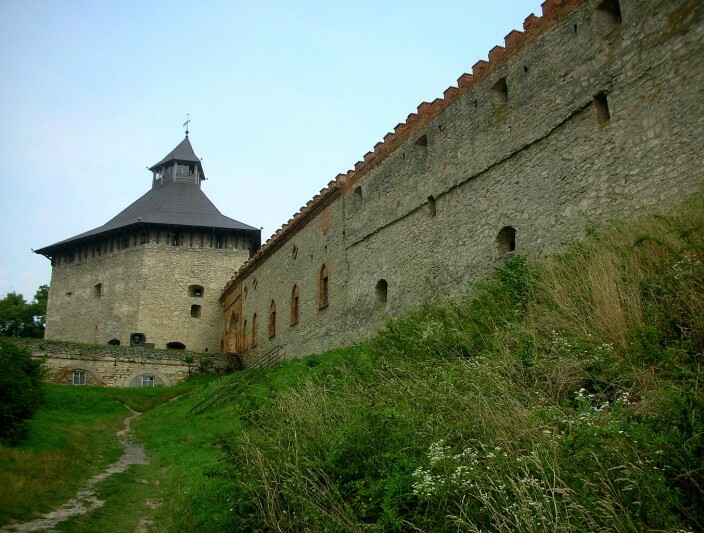 This particular castle holds a special significance for me as it was the first one I ever visited in Ukraine and well, you never forget your first time, right? It’s not the biggest or most beautiful or particularly famous, but it’s pretty cool nonetheless. One of the many things I appreciate about Medzhybizh is its out of the way location and total lack of crowds. Part of this is due to the fact it takes a bit of effort to get there. The easiest way is taking a bus west toward Khmelnitsky. 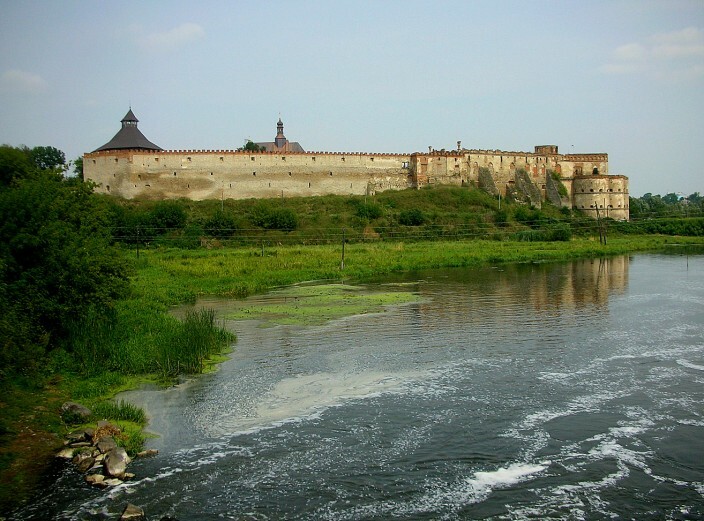 You disembark at a nondescript stop along the main highway and then walk several kilometers, a couple of miles, to the castle. There is little or no entrance fee and inside it’s mostly a do-it-yourself and definitely a do-it-at-your-own-risk proposition. Some restoration has been carried out on the walls and interior, but a whole lot more remains needed. There are dangerous holes in the ground, crumbling stone and masonry, cordoned-off towers and a number of places only fools and teenage boys would dare to tread. I know because we saw them. There is a small Orthodox chapel undergoing restoration on the grounds inside. Best of all is a wide and tall observation tower which can be climbed via a series of interior stairways. There are numerous lookout windows along the climb up and once you reach the top a commanding view of the surrounding countyside and river. Word of caution: watch your step going down the first few nearly vertical sets of stairs. Head clearance is minimal and a wrong step will cost you dearly. You can descend facing the steps or facing out, but neither way is especially comfortable. Eventually we made it down, spent a little more time inside the walls, then went outside and circumnavigated the exterior of the castle. 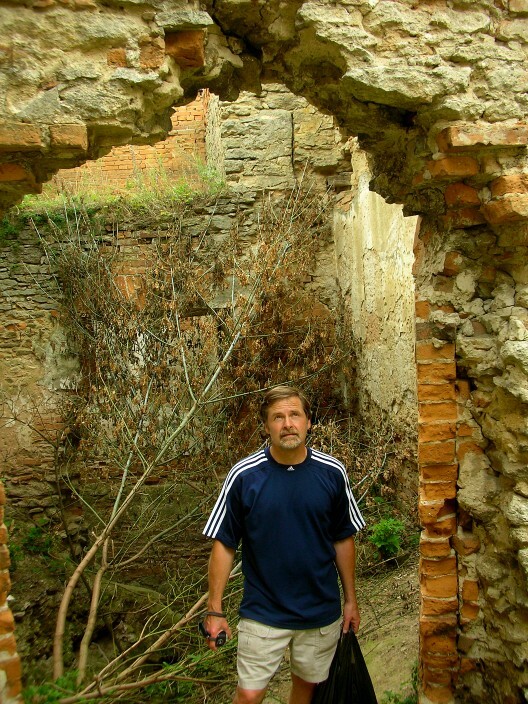 Impenetrable is the main word which sprang to mind standing beneath the massive walls, and a certainty that I would not want to be one of the guys trying to storm this place and get inside Medzhybizh the hard way. So there you have it, life in small town Ukraine. 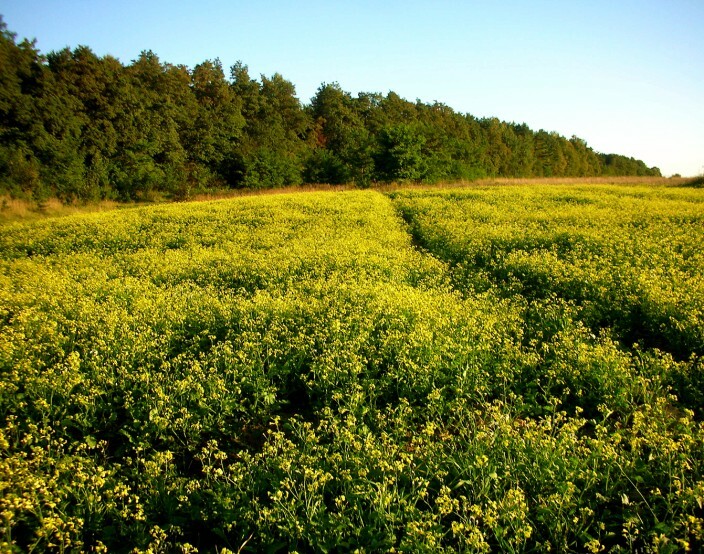 I’ve had the pleasure of experiencing it a number of times, and after being away for a year or so, I find myself missing its charms, the rural atmosphere of a slower pace of life, the calm and quiet. Okay, honestly, I don’t miss the neighbor’s rooster crowing at four a.m., but in most other respects it’s always good to go back. Thanks Medical coding jobs for your very complimentary comments about my site, glad you are enjoying it. Thanks Marta for checking out the site. In answer to your question, my wife tells me that yes, there is a Lenin Street in Letychiv. Could I ask how you know of Letychiv? Have you been there? Is thea a Lenin Street in Letychiv or has it been renamed?